Filmora Scrn helps you capture and edit FaceTime video calls on Mac. There are a number of ways through which you can record FaceTime video calls. If you want to use a Mac, there are different applications that would serve the purpose. Wondeshare Filmora is one of the easiest video editing software. It is trendy and allows you to ignite your story, irrespective of your skill level. Filmora has a free recording feature that you can use to record FaceTime video calls. The software has versatile features that will allow you to record and edit your video and also add special effects. Once you are done, you can share your final video through social media or other mobile devices. Step 2. Find the camcorder icon, usually above the timeline and left click on it. This will grant you access to screen recording. Step 3. The next step is customizing the recording area, which is done by choosing from the full screen and the window pop ups. Turn on recording from microphone and computer audio system. Step 4. Click on the record button to start recording a FaceTime video call. Step 5. Once you are done, click on stop recording and the recorded file will automatically be saved in the media library. There are a number of tools that can be used to record FaceTime on iOS devices. Some of them main options include Vidyo and Airshou. There is also an app known as Screenflow, which can be used to record FaceTime on an iOS device. This is a versatile app that can be used to record anything on your screen while using the iOS device. You can plug in a microphone or any multi-channel device to complete the recording. ScreenFlow also allows you to edit your video and add effects in the form of music, animations, text, images and transitions. The final production will be a professional podcast, which you can export in MOV, M4V, MP4 or animated GIF formats. Step 1. You should start by downloading and installing the ScreenFlow app on your computer. Step 3. Ensure that your iOS device is connected to your Mac. Step 4. Click new recording, on the option on record from, select the iOS device and then click on the red button to start recording. 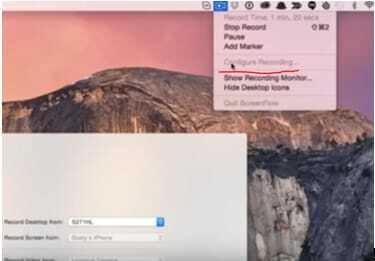 You can record FaceTime video calls on a Mac, using the desktop screen recorder. To be able to do this, there are so many free tools that you can use like Filmora. The second option is to record FaceTime video calls by connecting an iOS device to a Mac computer. For this, you should find software that has the mirroring and recording features. Some of the best software apps include airplay, drphone, reflector and Apowersoft among others. QuickTime player has the capacity to record on screen and iOS device. However, there is a limitation in that is cannot record sound. Even with the use of other tools, you will not be able to hear any sound from the speakers during the recording, which is rather disappointing. 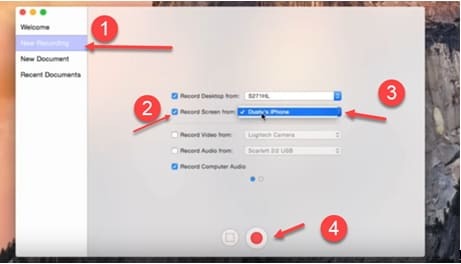 The last option is recording FaceTime video calls using your iOS device, without connecting it to a Mac. This can be done using apps like bbrecorder, Vidyo, and Airshou. These are some of the main ways that can be used to record FaceTime video calls. All of the options are effective, what you would need to do is find the one that serves your needs in the best way possible. Most of the apps and tools are free to use and have versatile features.